Planets Live Wallpaper (Android) - Some cool-looking planets! ~ Android Forever! Planets Live Wallpaper (Android) - Some cool-looking planets! Going through planetary withdrawal? Searching for your next planet fix? Look no further! This beautiful live wallpaper will have you sailing in planetary bliss. Developer Quote - "Enjoy the beauty of our Solar system. It shows the Sun in his mighty beauty and the planets crossing the screen in front of it!" 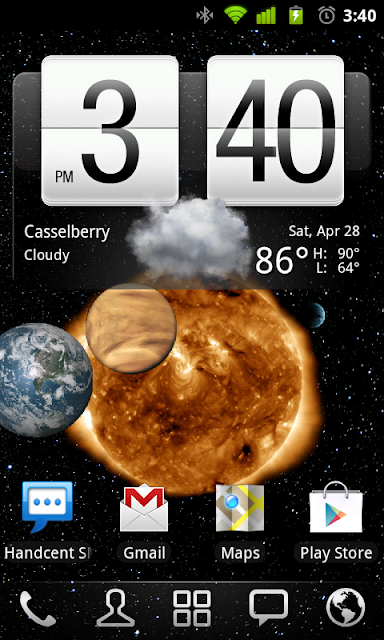 Planets Live Wallpaper is FREE on the Android Market!